The evolution of morphological diversity is best addressed through a good knowledge of form-function relationships. My research uses two separate, but complementary approaches. I use morphometric methods to document and quantify patterns of morphospace occupation and shape evolution. I also use biomechanical approaches to link form to function. This figure from my 2008 Paleobiology paper with Blaire Van Valkenburgh shows deformation grids for similar phases in the evolution of felid (left), barbourofelid (middle) and nimravid (right) sabertooths. I use a variety of morphometric approaches to quantify shape and morphospace occupation. For example, I’ve used traditional linear morphometrics to quantify patterns of functional trait evolution in canids and felids. I’ve used 2D geometric morphometric methods to look at trends in the evolution of skull shape in sabertoothed carnivores. I’m also interested in 3D approaches to studying the evolution of morphology. The increased availability and affordability of visualization techniques such as CT and laser scanning means that it’s now possible to collect a large amount of high res 3D data on a more limited budget. I’m currently involved in projects looking at 3D shape evolution in boxfishes (with the Alfaro lab at UCLA) and ants (with the Powell lab at GWU). Finite element models are constructed from 3D data (here CT) assembled into a solid model that is then cleaned and “meshed” to produce an FE model that can be loaded with forces to simulate biting. During my dissertation work at UCLA with Blaire Van Valkenburgh, I used Finite Element Analysis (FEA) to investigate the implications of cranial shape variation for mechanical performance. FEA is an engineering tool used to predict stress and strain in man-made objects when placed under load but has recently become popular in biomechanical analyses of feeding behavior. worked with Betsy Dumont and Ian Grosse at UMass Amherst to develop protocols for appropriately scaling FE models of different size and performed analyses of feeding performance in canids, felids, and ursids. 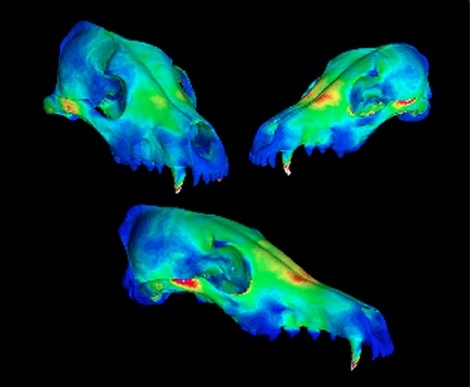 FE results for bilateral canine biting in three species of canid from my dissertation work. Clockwise from top right: African wild dog (Lycaon pictus); black-backed jackal (Canis mesomelas), and Ethiopian wolf (Canis simensis). I’m now using FEA to investigate how shape variation affects functional performance, and thus determines morphospace occupation, using theoretical shapes. Combining 3D shape analysis techniques with biomechanical analyses such as FEA and Computational Fluid Dynamics will have a huge impact on our understanding of form-function relationships in coming years.